Kenyan runners have dominated men’s and women’s distance running for decades now, and they own 18 world records, from the middle distances to the marathon. 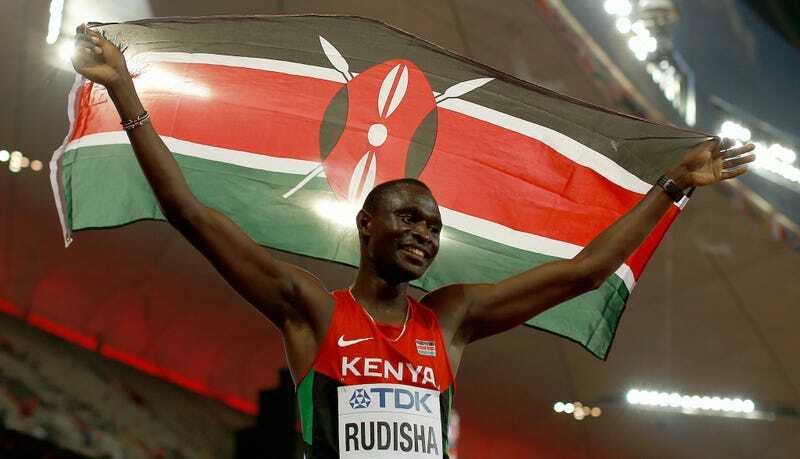 Nike has an exclusive sponsorship agreement with the Kenyan athletics federation (Athletics Kenya), wherein they pay a boatload of money for Kenyan athletes to wear their shoes and gear. They’ve been bankrolling the federation’s athletes for over 20 years, but after Chinese company Li-Ning made a competitive offer, Nike allegedly paid out hundreds of thousands in “honorariums” and “commitment bonuses”on top of the $1.3-$1.5 million they pay already, according to a report from the New York Times. Surprise! The money disappeared. The middleman? That’d be Papa Massata Diack, son of our old friend Lamine Diack, who is currently banned for life from the IAAF (athletics’ ruling body). According to documents obtained by the Times, Kenyan officials worked to secure the $500,000 commitment bonus in part to pay back Li-Ning. Nike, for their part, hasn’t exactly concealed that the payments took place. The commitment bonus was right there in their contract, and the honorariums were earmarked for travel expenses and other specific uses when they were sent over. The Times spoke to analysts who told them that the deal between Nike and the Kenyans was probably not liable to be prosecuted or investigated under the Foreign Corrupt Practices Act, and there are reportedly no plans for American officials to get involved. Nike’s clout within the sport is substantial, and they constantly flex their muscles. They’ve threatened to sue people for simply removing the swoosh from photos, booted a racer from the U.S.A World Championship team for refusing to wear Nike gear, and prompted a protest from racers for allegedly buying a race. As for this case, the specifics are murky. Obviously the Kenyan officials who made off with the money are at fault, but Nike’s role in sanctioning or not sanctioning that corruption is unclear, and might not ever be. The Times story cites multiple people who refused to speak up on or off the record for fear of their lives. It would be naive to believe that Nike could have had no idea that its generous payments could be so easily misappropriated, since Athletics Kenya has had corruption problems as long as its existed. Kenyan anti-corruption officials have called on the American government to hold Nike accountable, but they have no incentive to do so. The United States has been pushing for Kenya to enact better anti-corruption laws, and casting suspicion on one of their largest companies’ involvement with one of Kenya’s most visible cultural exports would severely undermine their credibility. The athletes at the center of this whole saga hold the nuclear option. Kenyan runners protested in November when the payments first became public. It’s very very unlikely they’d risk alienating the sponsors and federations involved with the Olympics (which has its own series of corruption messes) by staging some kind of protest, but they’re the ones who are left in the lurch when officials skim off the top of Athletics Kenya’s accounts. Money that is supposed to be spent developing young runners and improving infrastructure never makes it that far down, and thus the sport suffers. It’d be ridiculously idealistic to expect athletes to put their careers aside and risk their livelihoods in order to take a stand. But it might take something that seismic to shake up Athletics Kenya.